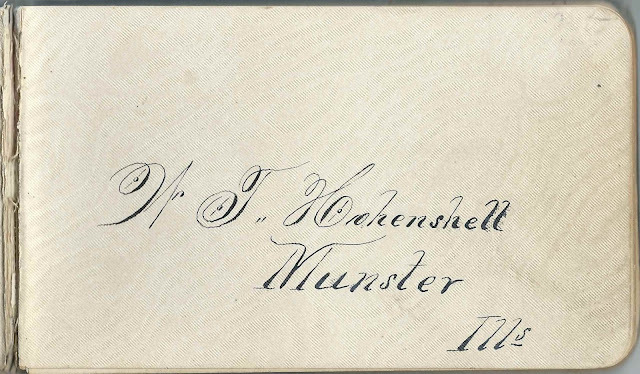 1880s autograph album that belonged to Warren Thornton Hohenshell of Munster, Illinois; with several inscriptions by his daughter Jean Sara Hohenshell in the 1890s and 1900. Warren wrote his name on an end paper and penned a page of welcome to his inscribers. The album measures approximately 6" by 3-3/4" and contains the sentiments of about 20 of Warren's friends and daughter. An alphabetical list of the inscribers, together with any personal information they offered, appears at the end of this post. Warren Thornton Hohenshell was born on May 3, 1858 in Indiana, the son of George W. Hohenshell and Elizabeth (Coan) Hohenshell. Warren married Iowa native Ida Mary Eliza Heald about 1888, according to the information in the 1900 Census of Elsinore, California. Warren and Ida made their home at Elsinore and later in Merced County, where they farmed. Warren reportedly pioneered the almond industry in his area. I found a newspaper article about an explosion at his almond distillery that resulted in severe burns to Warren and another man. Warren also worked as a photographer at Merced, California, from 19105-1910 and sold Studebakers. 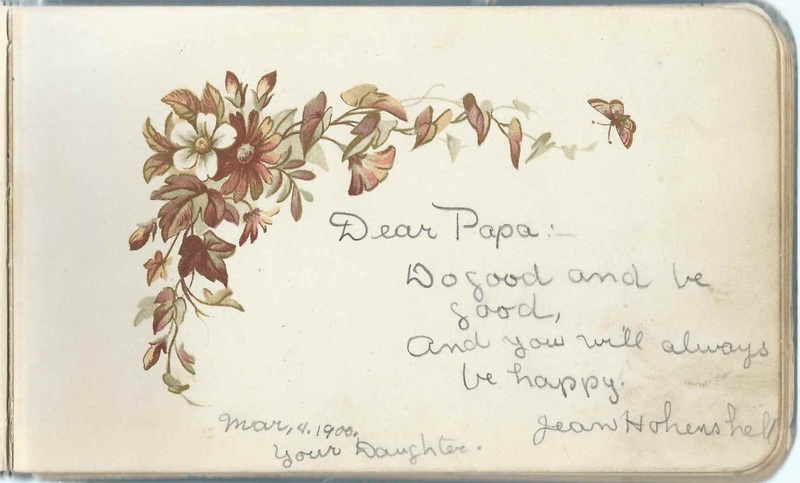 The couple had at least one child, daughter Jean Sarah Hohenshell, who inscribed several pages in the album, including the one below, inscribed on March 4, 1900. By 1938, Warren and Ida had moved to Pasadena, California. Warren died in 1940 and Ida in 1943. If you have corrections and/or additions to the information above, please leave a comment or contact me directly. 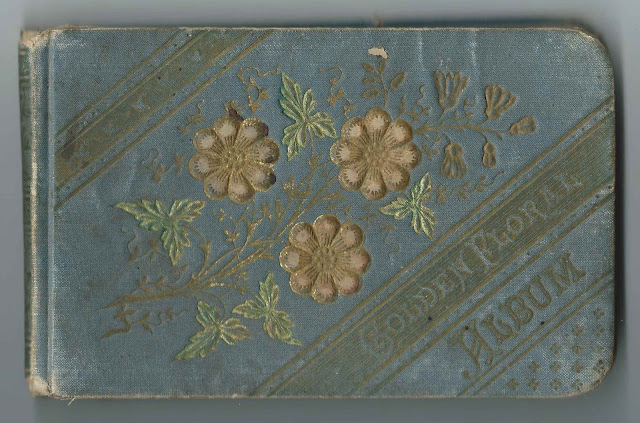 J. P. Coan of 4,6 & 8 Lake Street, Chicago, Illinois; inscribed on May 22, 1882. Presumably related by blood or marriage to Warren's mother, Elizabeth (Coan) Hohenshell. C. A. Hepler; inscribed at Munster, Illinois, on August 30, 1882. Warren's cousin, either Charlotte A. Hepler or Christopher A. Hepler, child of Christopher Columbus Hepler and Mary Ann (Hohenshell) Hepler, who was a sister to Warren's father George W. Hohenshell. Keziah A. Hepler; inscribd on September 2, 1882. Keziah Adeline Hepler, daughter of Christopher Columbus Hepler and Mary Ann (Hohenshell) Hepler, who was a sister to Warren's father George W. Hohenshell. W. T. Hohenshell of Munster, Illinois. 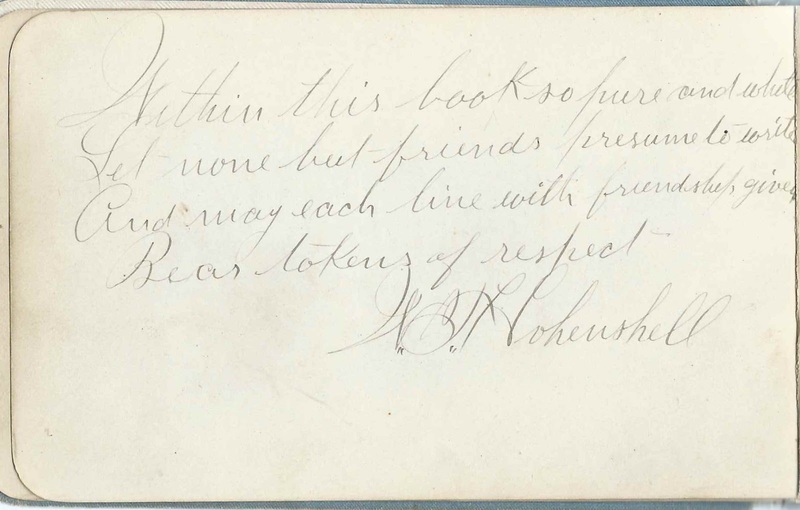 Album owne Warren Thornton Hohenshell, who penned his name on an ownership page and inscribed a dedication page. 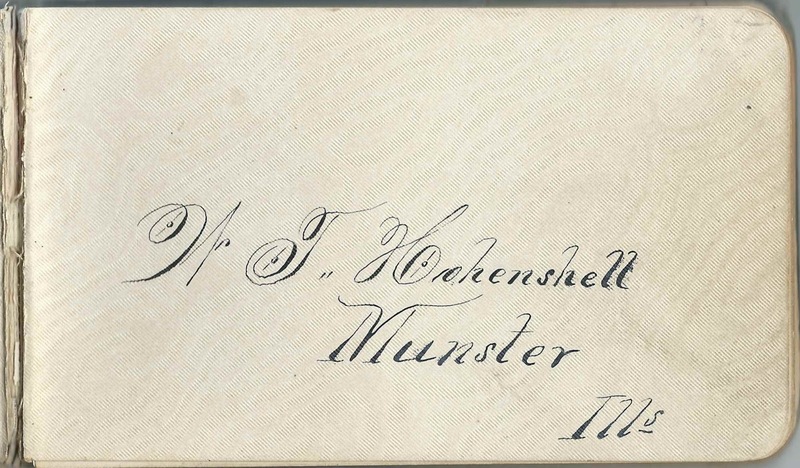 Jean Hohenshell; inscribed on March 4, 1900. She was Jean Sara Hohenshell, daughter of album owner Warren Thornton Hohenshell. Jean Sara Hohenshell, though she did not sign her name. Daughter of album owner Warren Thornton Hohenshell.